What is the difference between Signal_Provider_ID and the FilterMasterAccounts? Excellent question. First I would note that the Signal_Provider_ID is available only with the LTC VIP license. Now here’s a simple example of how you can use FilterMasterAccounts option. Say you have Master #1 and Master #2. 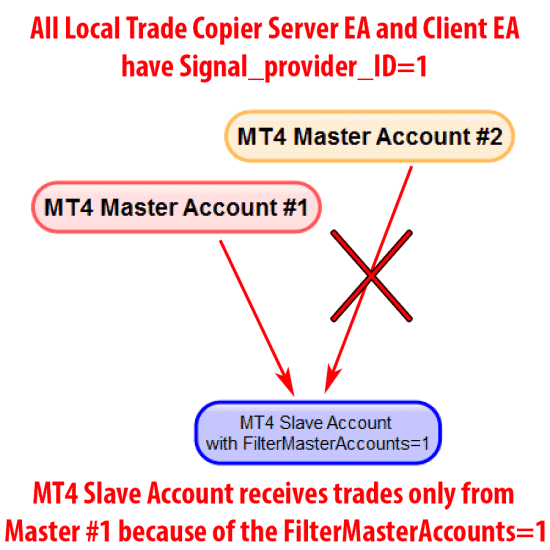 If you enter FilterMasterAccounts=1 on the Client EA, then you will receive trades only from #1 master. All master and slave Signal_Provider_IDs must match. But if you want to have separate groups of trade copying campaigns you need to use the Signal_Provider_ID option. Say we add one more master account to our previous example. So we add Master #3 and want to copy this to Slave #9 (or some completely other group of slaves) and do not want to mix the trades. So you simply use Signal_Provider_ID=2 on the master #3 and slave #9. 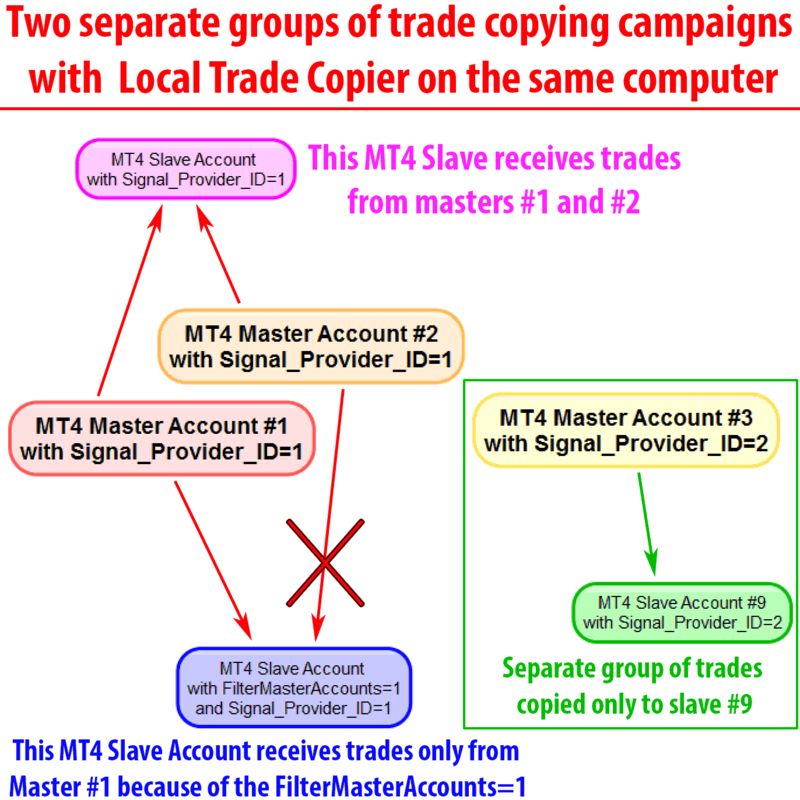 Otherwise, if you use Signal_Provider_ID=1 on the slave #9 it will receive trades from all masters #1, #2 and #3. In this case you will need to use FilterMasterAccounts to separate trades. But remember, if master #3 is a completely different trade copying campaign (like another strategy) and you just do not want to mix those trades then you can separate them with Signal_Provider_ID=2. Then you do not need to mess with FilterMasterAccounts. So once again. If you have master #1, #2 and #3 and all of these trades should be copied to a different sets of slave accounts, it is just easier to use Signal_Provider_ID to separate them into groups instead of using FilterMasterAccounts option for each Client EA. You may also want to check the The Definitive Guide to Forex Trade Copying to learn more about how to use the Local Trade Copier and copy trades between multiple MetaTrader 4 accounts. Another feature explained well and is there no end to these additional features development? Yours are the best and most reliable EA’s out there so thanks again for the pro-active support and explanations. Can LTC Server EA set the stop loss and take profit on my trades?